About a year and a half ago I gave up refined sugar (for the most part). Being the pastry freak that I am, this was a challenge. The hardest part was dessert after dinner. As my grandfather always says, “you must have a little gliko (Greek for ‘sweet’) after every meal!” So, I set to work researching the best, most natural, least processed sugar-substitute that I could use in baking, and started searching the internet for recipes. I settled on agave and found a great peanut butter chocolate chip cookie recipe that I modified to use agave instead of a fruit-sweetener. These cookies keep me sane. I make them practically all the time so that there have been very few days in the last year when these cookies haven’t been in the house. When I bring them to work, arguments can break out if I don’t bring one for everyone. I know at least one other person who is nearly as fanatical as I am about making these cookies. She uses these to control her diabetes. Don’t worry though, even with the whole-wheat flower and nut butter, there’s nothing medicinal about how these cookies taste. The might be the best thing ever. I’m just saying. I consider them open-source, so let me know if you make improvements on the recipe. Hmmmm.. I dont know that I could give up sugar. I do however like raw sugar, organic, and agave. Cookies look delish! Maybe I will make them for the boys! I gave up refined sugars quite a few years ago and have been using agave nectar ever since. You might be interested in my blog, Altered Plates, which focuses on baking and cooking with agave nectar instead of other sweeteners. Good luck in your journey. It gets better. 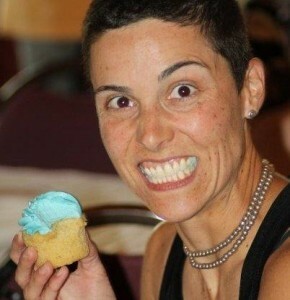 Most of all I love the blue icing in your lovely white teeth! i swear these are the best cookies eva in the history of the world…i’m just saying. Missing you so I’m going to make cookies with the ingredients you left at my house. Omigosh these cookies are insane amazing! this recipe is now my GO TO cookie recipe! I just made these for friends, and they were wonderful. The texture is better than any peanut butter cookie recipe I’ve tried, and better than most vegan cookies of any flavor. Thank you for sharing it. I made these cookies today and they are delicious. I am on a very strict low GI diet and have given up nearly every sweet. How nice to know there are cookies I can eat! Thanks. Do you have any other baking recipes that use agave/whole wheat flour? So far the cookbooks I’ve tried have been lame. I would love any other recipes you’d like to share. WOWZA! I just made these cookies using your recipe and they are fantastic! Thank you for sharing the recipe!!! I added 1/3 cup of oats and 2/3 ww flour and a handful of craisins. Yummy! AMAZING! 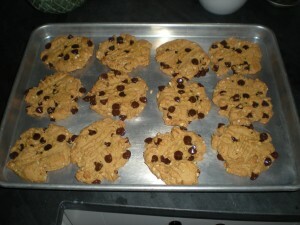 I just made these cookies with chunky peanut butter and quinoa flour. They are so good! I’m going to post a link to these from my website. Thanks!! My daughter and I just made these cookies for the second time and they are absolutely fabulous! My favorite part is that it’s totally fine for my 2 year old to hover over the bowl and taste the dough, which she does a lot, since there are no eggs in this recipe. Thanks for sharing this recipe. My daughter will continue to request these and it’s nice that I can feel really good about having these around the house as a healthy and incredibly tasty treat! These were amazeballs. I only had about 1/2 cup of almond butter, so I also added about 1/2 cup of earth balance. Deeeelicious! Thanks for this recipe! Thanks for this recipe! Made it with homemade chocolate chips (they had a bit of sugar, but you can use stevia too). Delciousities!! Mmm . Made these with spelt flour as didn’t have quinoa so not strictly wheat free. Used cocoa instead of choc chips. They turned out as gorgeous mini choc cakes that we sandwiched fruit spread inside – delicious!